An Optical lens edger is a part of optical manufacturing equipment that edges, cuts, or grinds optical lenses so that they can fit into the selected frame. The lens edger edges the optical lens according to the tracing data imported from the tracer unit. There are various types of edging modes such as automated beveling, controlled beveling, ex lens edging, rimless edging, automated grooving, and controlled grooving among others. Lens materials used for edging are plastic, glass, high-index plastic, acrylic resin, and polycarbonate. Nowadays, edging systems are available in an all-in-one type, which includes edging, blocking, drilling, grooving, and tracing in a single unit. The global optical lens edger market is projected to reach a market size of about US$ 651.3 Mn by 2026, expanding at an average growth rate of about 6.5% during the forecast period. The global optical lens edger market is anticipated to be driven by a rise in demand for optical lens edgers from the ophthalmology and camera industries. It is estimated that roughly 1.3 billion individuals around the world live with some type of vision impairment. With respect to distance vision, 188.5 million individuals have gentle vision impairment, 217 million have moderate to serious vision disability, and 36 million individuals are blind. Concerning close vision, 826 million individuals live with a close vision disability. Overall, the main sources of vision debilitation are uncorrected refractive mistakes and waterfalls. Around 80% of all vision hindrance internationally is viewed as avoidable. A significant portion of individuals with vision impedance are above 50 years of age. The global vision industry is valued at US$ 40 Bn. It includes both sales and services of corrective eye glasses and lenses. The industry is anticipated to expand at a stable growth rate of about 3% to 4%. The current structure of the vision industry is highly fragmented, owing to the presence of a large number of small scale players throughout the value chain. However, there are large players in this market that are vertically integrated. For instance, Luxottica and Essilor. Demand for optical lends edgers is likely to increase from the ophthalmology end-use industry. The digital camera industry is flourishing owing to an increase in the use of digital cameras by hobby enthusiasts, photography professionals, marketing professionals, etc. The digital imaging industry is undergoing major transformation across diverse applications placing greater demand on the technology and component sides. A new imaging ecosystem involving photos, videos, imaging, and visual communication is the face of this industry growth. New players, technologies, and market segments are continuously evolving in this industry. The importance of digital media is on the rise due to an increase in the social media usage of consumers. More and more consumers are sharing digital content in the form of photos and videos. This is boosting demand for imaging devices such as cameras and, in turn, sales of camera lenses. Hence, this factor is anticipated to drive the optical lens edger market. However, optical lens edger manufacturers are anticipated to face challenges due to various aspects of maturity in the production cycle. A declining rate of product improvement indicates that products have reached technical maturity. Moreover, the manufacturing process is shifting rapidly towards standardization of assembly procedures. Increase in the use of contact lenses by consumers is impacting sales of spectacles negatively. Sales volumes of digital cameras are declining yearly owing to a rise in the sales of smartphones. Therefore, the optical lenses market is slowly approaching maturity. The market share and price structures of companies installing optical lenses into their end-products are increasingly stabilizing, owing to merger and acquisition activities. The imaging and vision industry is gradually showing signs of competitive maturity. These factors are expected to create a challenging environment for players operating in the optic lens edger market across the value chain. The design and structure of optical lens edging machines are becoming increasingly simplified as higher efficiency is achieved through automation in their operations. This allows less manual intervention, making the edging process speedy. The machines comprise an integrated 3-D drilling unit with control by 5-axis mechanism. This type of unit offers high-quality beveling and grooving performance to provide an attractive edge surface. These machines range from compact designs to integrated large units with advanced intelligent blockers and integrated imagers. These factors makes the simplified, efficient, and automated lens edger a trending product. Some of the key players profiled in the global optical lens edger market are Essilor International S.A., Topcon Corporation, NIDEK CO., LTD., INNOVA Medical Ophthalmics Inc., Coburn Technologies Inc., Huvitz Corp., Mei Srl, Santinelli International, and Shanghai Supore Instruments Co. Ltd. This report on the global optical lens edger market provides analysis for the period 2016–2026, wherein 2017 is the base year and 2018 to 2026 is the forecast period. Data for 2016 has been included as historical information. 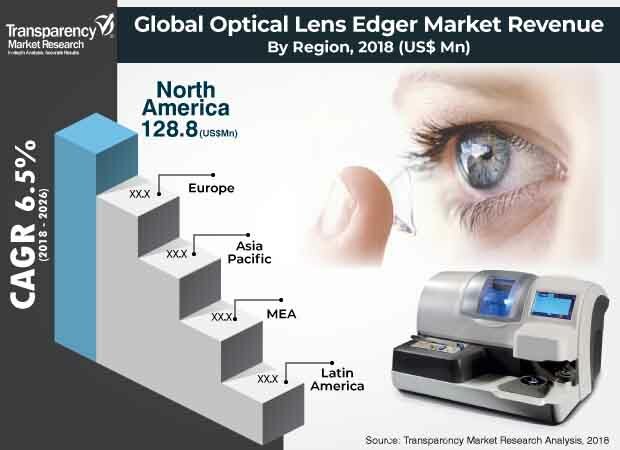 The report covers market dynamics, including drivers, restraints, opportunities, and trends expected to influence the growth of the optical lens edger market during the said period. The study provides comprehensive analysis on market growth throughout the above mentioned forecast period in terms of value and volume estimates (US$ Mn and Thousand Units) across different geographies. The global optical lens edger market is projected to expand due to dynamic aspects such as rise in demand from the ophthalmology industry and impact of a rise in demand for camera products. However, the global optical lens edger market is facing a challenging environment from the three different aspects of maturity in the production cycle. Nevertheless, significant demand for in-office finishing labs in the ophthalmology industry is likely to offer attractive opportunities to the market. Simplified, effective, and automatic edging equipment are trending products in the global optical lens edger market. The optical lens edger market has been segmented based on type, application, and region. Based on type, the global optical lens edger market has been classified into manual optical lens edger, automatic optical lens edger, and Semi-automatic optical lens edger. In terms of application, the global optical lens edger market has been categorized into eyeglass lens, microscope lens, camera lens, others (telescope, binoculars, etc.) Based on region, the report classifies the market into North America, Europe, Asia Pacific (APAC), Middle East & Africa (MEA), and South America. The report highlights key developments in the optical lens edger market. Porter’s Five Force Analysis, which identifies bargaining power of suppliers, bargaining power of buyers, threat from new entrants, threat from substitutes, and degree of competition, is included in the report. Value chain analysis, which shows workflow in the optical lens edger market and identifies raw material service providers and distribution channels, are covered in the report. Segment trends and regional trends are part of the report. It also covers segment-wise comparison matrix, incremental opportunity analysis, and market positioning of key players for all regions covered in the scope of the study. The report includes the competition landscape, which covers competition matrix and market share analysis of major players in the global optical lens edger market based on their 2017 revenues. It also includes profiles of major players. Competition matrix benchmarks leading players based on their capabilities and potential to grow. Factors such as market position, offerings, and R&D focus are attributed to a company’s capabilities. Topline growth, market share, segment growth, infrastructure facilities, and future outlook are attributed to a company’s potential to grow. This section also identifies and includes various recent developments by leading players in the optical lens edger market. Company profiling includes company overview, major business strategies adopted, and key developments. The companies profiled in the global optical lens edger market include Essilor International S.A., Topcon Corporation, NIDEK CO., LTD., INNOVA Medical Ophthalmics Inc., Coburn Technologies Inc., Huvitz Corp., Mei Srl, Santinelli International, and Shanghai Supore Instruments Co. Ltd.